Are you wondering what holidays are really all about? Well they are about traveling, relaxing and of course tasting. The Mediterranean cuisine has so much to offer to you but when visiting the island of Santorini there are some exquisite tastes that you need to try. Perhaps the most popular worldwide and at the same time traditional product of the island -that is a huge economical source for the local producers since it is cultivated on the island for thousand of years- is the popular “fava” that you have to try during your stay. You will find it as an appetizer served in all the restaurants of the islands and not only from the traditional taverns of the islands to the most exquisite restaurants offering not only greek cuisine but more European dishes. So what is this thing called “Fava”? 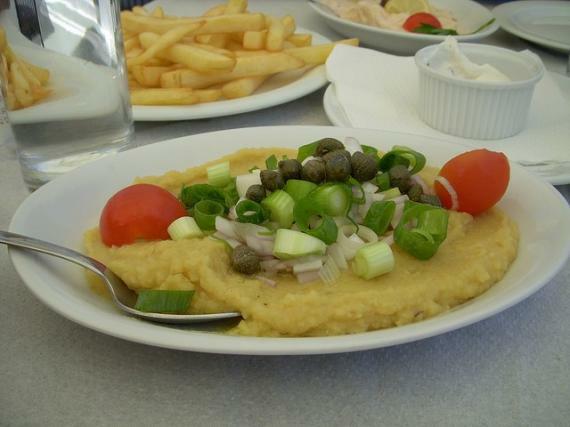 Fava is a legume that is cultivated in Santorini for centuries and its size is no bigger than a grain of thick sand. This amazing row material has an unforgettable taste and the dish is perfectly accompanied with fresh onion. Fava fried with onion is one of the traditional dishes of the local cuisine and is known with the name 'Fava pantremeni'. The thing is that the locals serve fava in many different ways depending on the time of the year and the appetite of the cook in charge!Fava could be served with meat and vegetables and is the ideal appetizer to start an amazing meal.Fava took its name from the word “favus” that means a wide or wide bean and is now the major appetizers that you will love!The European Union have acknowledged that the Santorini fava beans are unique. Who would have thought that this small island, famous for its caldera and amazing views, would have such a great quality fava famous worldwide for its unique and unforgettable taste?